As we hurry through 2016, the end of this decade doesn't seem that far away. So when you hear that we're getting at least 8, maybe 9, possibly even 10 DC Comics superhero movies before 2020, it sounds like an almost impossible task. But apparently, these movies will arrive all interconnected to each other, bouncing off the previous installment. 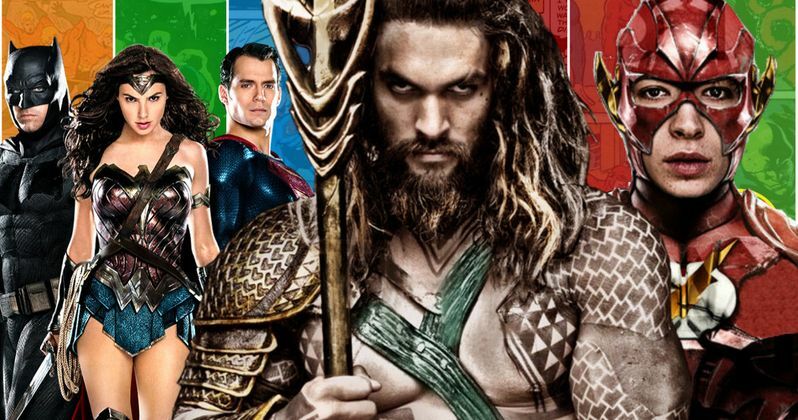 And that will certainly be true with the Aquaman and The Flash movies, which will be a continuation of the events set up in Justice League. Justice League Part 1 will arrive just in time for the Thanksgiving holiday next year. The next two movies immediately following in 2018 will be The Flash, which arrives in March of that year, and then Aquaman, which is getting a July release. Both of these solo characters are confirmed to have a presence in this month's Batman v Superman: Dawn of Justice, however fleeting it may be. And while these are just mere cameos, writer Chris Terrio, who penned both Batman v Superman: Dawn of Justice and Justice League Part 1, feels it's incredibly important to introduce these characters right now. He explains. "If you bring in a character in a kinetic way, then you accept the reality more easily." Following this year's Batman v Superman: Dawn of Justice and Suicide Squad, Wonder Woman will be the first DCEU movie released in 2017, and is shooting now. Justice League Part 1 then begins shooting this April, giving star Gal Gadot no time to breath between franchise sequels. All of these movies plan to introduce their characters in the same way, appearing in someone else's movie first before setting off on their own adventure. As the Justice League Part 1 story will continue on in Aquaman and The Flash, Diana Prince's Batman v Superman: Dawn of Justice story will also continue on in her own solo movie, which makes perfect sense. Batman v Superman: Dawn of Justice is being called a 'naturally starting point' for Justice League Part 1. Writing the epic superhero ensemble actually had Chris Terrio studying a number of topics he never would have explored otherwise. He says this. "Red- and blue shifts in electromagnetic physics to think about the Flash, investigated deep sea biology in the Mariana trench to create the world of Aquaman and read the Greek historian Diodorus of Sicily's account of the war between Amazon and Atlantis to better understand Wonder Woman. If you told me the most rigorous dramaturgical and intellectual product of my life would be superhero movies, I would have said you were crazy." It sounds like Justice League Part 1 is the focal point of one giant interconnected story that shoots off in various directions as each individual superhero continues his mission from this vantage point. The DCEU is said to be more closely interlocking than the previous Marvel standalone movies. We're not sure how this will all play out in the long run, as no plot details for any of the upcoming movies have even been hinted at. What do you think about DC's movie to have their movies play in more of an episodic arc as opposed to true standalone adventures?